We Live In A Political World: #262 / Why Is This Person Smiling? #262 / Why Is This Person Smiling? 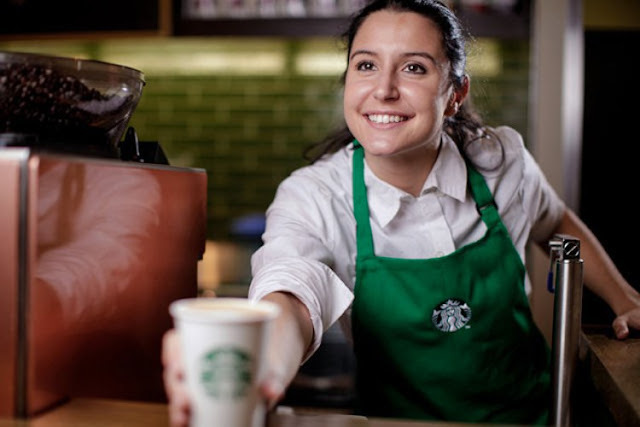 According to John D. Stoll, writing in The Wall Street Journal, baristas and other line workers at Starbucks get stock distributions, as part of a corporate "Bean Stock" program. Nearly all Starbucks employees are included in the program, and Apple has implemented something similar for its employees. Just to emphasize, these programs provide corporate stock to ordinary employees, not just to top executives! I think that this is a very good idea and that corporate workers should, by virtue of their work for a corporation, receive a meaningful share in corporate ownership. This is not an idea that necessarily has to depend on enlightened corporate leadership, either. Well, not if we have some enlightened governmental leadership! For those who think that the incredible wealth inequality and income inequality that prevails in this nation is putting our future as a democracy at risk (I'm raising my hand), there needs to be some effective way to reduce or eliminate those wealth and income disparities. One way would be to mandate that anyone who works for a corporation must be given a significant share in the corporate enterprise by requiring all large, public corporations to make significant stock distributions to their workers (besides meeting minimum wage and other requirements, of course). Our tax system could be pretty easily reconfigured to impose very dramatic taxes on large corporations, with tax deductions being given if the money that would otherwise go to pay corporate taxes were distributed, instead, direct to workers, by way of a distribution of corporate stock. That would eliminate the federal bureaucracies that would otherwise be needed to collect and then redistribute the tax monies collected from the corporations. Just an idea! Ponder it as you wait in line to order your next latte, or as the latest program update to one of your Apple devices downloads.